Let me begin with the following generalization: If it “aint Broke,” fix it before it breaks. I’ll explain. I have been actively observing and leading tefillot for children and teens for over sixty years. Among the young (ages 3-10), on the surface everything looks good. The pupils conform to expectations. They enjoy the singing (and dancing). They enjoy ritual. They want to please the teacher. Typically, this begins to break down in the fifth or sixth grade when they shut down and then act out. Why? If we probe a bit below the surface in the younger grades, we will see that many tefillot for the young are nothing more than an exercise in skills, and there comes a point where skills no longer motivate. What is missing is depth. The pupil knows the madua of school tefillah (it is imposed), but the lamah – purpose, meaning – is not self-evident. If, on the other hand, when the tefillot of the young consist of skills plus depth, as the child matures and challenges and tensions multiply, that child can come to see tefillah as the deepest time of the day, a time to reflect and meditate, celebrate success, discard a sense of failure connected to the previous day and feel connected to the group. How? Here are a few ideas. One cannot simply press a button and move from hol to kodesh. A set induction (see Mishnah Berakhot 5:1) – whether singing, meditation, a story, a walk outside to observe nature, etc. – can help make the transition. Tefillah should be connected to inyanei de-yoma. Mention should be made of events that impact on the lives of the pupils, their families, the school, etc. Following the Israeli army’s motto of Aharai!, in which officers are the vanguard, teachers can model this kind of sharing, and students can be encouraged to share as well. A kavvanah – or original prayer or poem – should be brought to each service, ideally by a pupil. There is a connection between kedushah and yofi (The Holy and the Aesthetic). The room in which tefillot are held can be designed by teachers and pupils to help engender a sense of kedushah. This is possible even in a multi-purpose room. Playing ”catchup” with teens is much harder. One suggestion is to create a Va’ad Tefillah so that the teens have a sense of ownership over the service. It is also important that the pupils acquire a basic siddur vocabulary (teenager questionnaires reveal frustration at not understanding the prayer texts). All of this is not a substitute for iyyun tefillah. 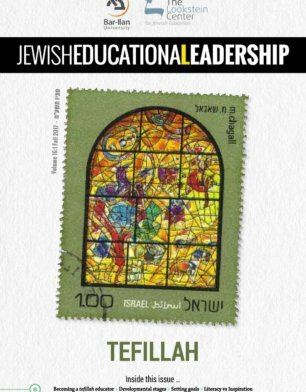 A brief devar tefillah is helpful but the study of tefillah (literary, rhetorical, or theological analysis) is a critical element in any curriculum that takes tefillah seriously. 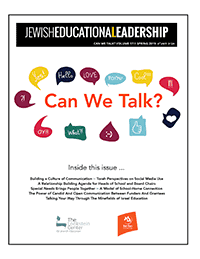 While beur tefillah can be useful, it is the active engagement of the pupil’s mind in the study that can most effectively build a connection between the prayer and the pray-er. Curriculum making is a form of “radical surgery,” i. e., we can’t teach everything. I would argue that because the siddur is a censored text, it can open our minds to understanding and appreciating the value-concepts that make Rabbinic Judaism distinctive while nurturing hakarat ha-tov. I would also argue that those who are both competent and comfortable in tefillah are most likely to be engaged members of the Jewish community. Clearly, one of the key commonplaces of curriculum is the home. A healthy child will choose the home over the school when they diverge. To gain the respect of the parents, we can point out, among other things, that the skills of textual analysis are transferable to all forms of reading. If the class atmosphere is safe and the pupils can express his/her ideas and ask his/her questions without hesitation while gaining thinking and reading skills, I find that parents are more likely to see the value of prayer study. One more thought. You can’t come to terms with something as a professional until you come to terms with it as a human being. Many teachers need support to be able to engage in iyyun tefillah. Wise administrators will build a structure to provide that support. Saul P Wachs (swachs@gratz.edu) is the Rosaline B. Feinstein Professor of Education and Liturgy, Director of the Doctoral program in Education at Gratz College. From 1980 to 2015, Professor Wachs was also the National Field consultant for the Solomon Schechter Day School Association.